First Home Dreams: Sounds like a case of the Mondays. Sounds like a case of the Mondays. I had a fantastic weekend. No house-mountains were moved, but it was productive and relaxing all at once. I wanted one more day! But what can you do - Monday has arrived. Saturday was spent doing chores (hello, laundry) while Mike was at a curling tournament. 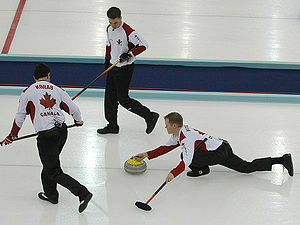 For my American readers, that's curling the sport. Sunday was spent trying to knock off one of the items on my January to-do list. this will hopefully happen this weekend <---- HA! We drove out to the Roadshow's Hwy 400 Antique Mall to see if we could find some chairs for the kitchen table. I love this antique mall - it's huge, not so jam packed that you can't even move around, and the prices on a lot of stuff is fairly decent. Unfortunately, there were no chairs to be had (any that we spotted seemed to come with a table and they wanted $1000 + for the whole shabang. No thanks). I did manage to thoroughly embarass Mike about 10 minutes into the treasure hunt. Do you see what it is!? A mechanical doorbell with a pull chain! I exclaimed/squealed and apparently got a few stares that I was oblivious to. No matter. I checked the price tag cautiously, and was pleasantly surprised. 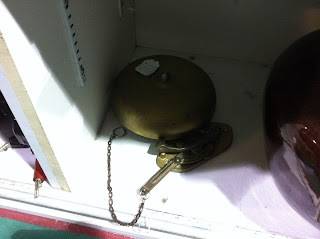 It was $40 and labeled as an "old school bell". Despite my excitement, I didn't buy it. It's far too big for what I'm picturing - the bell portion was probably the size of a dessert plate. And, the chain was far too short for our application. I was just so excited to see one in real life and not the fictional internet. So while we didn't walk away with chairs or a new doorbell, we did find some neat miscellaneous items that will show their faces around the house. All in all, a fun afternoon. We've been really slacking in the weekend warrior department lately, but hopefully we'll get back in the groove soon.